I have to learn that a dog does have to give up a bone from time to time, to leave to one side what isn't going to get resolved. 'Leave it there' is a sort of mantra. Until something seemingly new and ridiculous gets mentioned and I want to point it out. I refer back to the post on Thinking Anglicans where Simon Kershaw was good enough to reply to my criticism in detail and then I wanted to reply to that. And then he replied to my reply. There's another, different, discussion to be had about just what can be understood by 'the Word of God through whom the universe came into being' etc. Now we all know our classical Christian theology. It is that the Word, that is Jesus Christ, was the person who created the world. In classical Arianism God first made Christ and then Christ made the world, and in trinitarianism Christ made the world as part of the eternal person in the Godhead. I thought, oh leave it there. What's the point of saying, well, Chalcedonian via 21st century thinking (if such is possible) equals non-Chalcedonian nineteenth century thinking. And then, rereading it, you have the fully man limited, fully God, 'through whom the universe came into being'. How does that work then? So this, the word, Jesus Christ, sets the universe into being, and creates it (it's his job), through which, on a pale blue dot, an asteroid knocks out dinosaurs, little mammals succeed, human beings come about (evolution is chaotic, it is local, specific and unplanned) and then this second person of the trinity pays us a visit as fully man fully God. Can I suggest that, actually, twenty first century thinking, or even later nineteenth, doesn't fit with the Chalcedonian, and it is in fact a form of nonsense to try and join the two together? This is a new webpage just entered into the Pluralist website. A novel is a story where the road of progress from the beginning to end, motivated by an early inciting incident, is frustrated by some blockages or conflicts to be overcome. If there is no incident, and then no conflict or blockage, then there is no story of any interest. It won't engage the reader. Well, there might be description, and all sorts of happenings, but there will be no arrow going through time: just time and incidents. Even personal diaries develop narrative streams among many incidents. A novel should have a dramatic arc that consists of establishing the scenes, with background matters, the inciting incident, obstacles, the large-scale crisis, the climax and how it is all resolved including the way matters have improved in the end scenes. Throughout the novel can take time to discuss connected themes and issues. The idea here is not to write in a manner of painting by numbers. The above is the rule of thumb, but it can be proportionately variable depending on the breadth and message of the novel. A novel might be say ten years in the life, or ten generations, and may in fact be several overlapping novels. Establishing the scenes is going to be descriptive and lays out something of the appearance of the stage - who is who and where it is at. However, to do this alone is too boring even if made initially pleasurable. It ought to include a loose hook to grab the reader, and early, and set the theme prior to all the drama. The progress desired should be laid out, and something of the frustration to be faced. So there is a dilemma bubbling up, or a clue leading to the inciting moment. Still, a map might be useful. In my novel Serpensea Secrets, I have an early hook of two side characters appearing in a tabloid newspaper. It sets up the archaeology sub-theme and the sexual peculiarities of the geographical area, as well as the economy sub-theme. Plus the press will be important later in the story. The background incident, that is all important, is the relationships the lead characters had as teenagers, and this comes back regarding their sacred commitment made at the time and then how it wraps into the institution of the independent Liberal Catholic Church. With the scenes set, the inciting incident will be in context. This is the point where all changes and matters are unresolved. Complex novels may have several inciting incidents, and they may look like overlapping novels. The inciting indicent can be external, interpersonal or internal. External is that which is readily identifiable and inanimate, like from conventions or cultures, laws or governments, or rules and more rules. These can ignite the character/s into action and can provide obstacles. Dialogue is likely to be sharp and instant; description is necessary. The interpersonal is realised through dialogue and character description, the people in the story. They kick off the story, and they provide later obstances. Interpersonal conflict needs plenty of interactions. Interpersonal involves a conversation, more than likely, where a character becomes an enemy or has introduced a dilemma to be resolved. In Serpensea Secrets a telephone call says the lead character's husband is having an affair when he visits Harwich. this is the inciting incident, even though it is not the basis of the whole of the story. Internal incidents or conflicts are psychological. It is a thought that is unavoidable regarding future action, or what blocks progress from within the main character/s. It can be over activity or laziness, and various prejudicial attitudes. It's the part where the characters think and consider their motivations including from the very beginning. The dialogue characters make is as likely to conceal motivation as to reveal it, but the storyteller might be God-like and know what any person is thinking and let us in on the mind's secret. In a first person novel we should have access to that mind unless the first person is narrating and concealing. In Serpensea Secrets the lead character is a liberal thinker who has effectively lost her belief in anything specifically Christian and much of what she does is how she manages this in her paid deacon role, and deals with issues of qualitative truth and deception while her husband (who would have had her role) works ina quantitative truth or deception setting. An inticing incident that is internal would have to be a one large-scale psychological event (e.g. a religious conversion or deconversion). All inciting incidents involve motivation, especially with the main character/s regarding their progress, but also usually from those that provide the blockage (some blocking external incidents are just as they are). So the inciting incident is a predicament that means something must be done. This is where the progress needs to be made. In Serpensea Secrets the main character deviously uses her husband's firm's self-checking procedures to expose him having an affair. Then come the obstacles. Obstacles are also internal, interpersonal and external in direction, and it would be more interesting to have several of different kinds. The conflicts can be subtle or extreme; the greater the desire to get to a solution the greater ought the conflicts to be, though some can be less than others. In Serpensea Secrets there is a shift of the story; a supposed resolution of the affair becomes a question about the progressive or otherwise suffragan bishop, based on the iconic Serpensea Cross. They focus then is much more strongly on the lead character's career. Conflict should be dynamic, so that a sense of crisis builds and there can be a crisis point; resolution then becomes all the more dramatic too. So the crisis comes late in the novel. Conflicts and blockages come in many forms. They can be physical and rather concrete: it might be simple enough to walk around them (either literally or metaphorically). External Conflict is that which is readily identifiable and inanimate, like taking on conventions or cultures, laws or governments. Rules and more rules frustrate the freedom of the character. Dialogue is likely to be sharp and instant; desciption is necessary. Interpersonal conflict is realised through dialogue and character description, the people in the story who frustrate the progress of the main character/s whose solution the story seeks to work through. Interpersonal conflict needs plenty of interactions. Internal conflict is psychological. It is what blocks progress from within the main character/s. It can be over activity or laziness, and various prejudicial attitudes. It's the part where the characters think and consider their motivations. The dialogue is as likely to conceal motivation as to reveal it, but the story teller might be God and know what the person is thinking. Obstacles include twists and reversals. A twist is something unexpected that changes the perception of the reader about a situation. It may only be temporary. A reversal is more thorough and longer term in impact and may change the whole direction of the progress sought. What was thought to be the case is no longer, and it may well be that the reverse is true: thus reversal is more than a twist. Perhaps an obstacle became a blessing in disguise. In Serpensea Secrets the twist is about the suffragan bishop; the crisis isn't just the independent Church's strange Eucharist in the parish church that forces the career future for the main character but the later twist whether to trust him and take him in rather than expose him and his activities to the tabloid press. The crisis is the biggest obstacle, but to work within a novel its resolution should sort out the whole and allow the progress desired to be fulfilled. The crisis should have a kind of will it won't it knife-edge aspect to it, either in short or longer time. All then time themes can be discussed. In Serpensea Secrets there are themes of secularisation, illusionist magic and religious magic, Liberal Catholicism, Unitarianism, the decline of Christianity, archaeology changing its mind about the Romans and its economy, sexual norms, naturism, mental health, and the condition of the post-industrial economy and what is actually being value-added. When the crisis is solved the resolution should be well worth having, the progress of the novel all the more underlined. The crisis and how it was handled (in the end) leads directly to the benefits of the resolution. And with the crisis completely solved and resolution come as a reward, the novel can end with some scenes of happiness or satisfaction over the progress achieved. Some novels, however, build in a slight edge to the satisfaction by which all could kick off again. Life is like that. A sequel might follow. 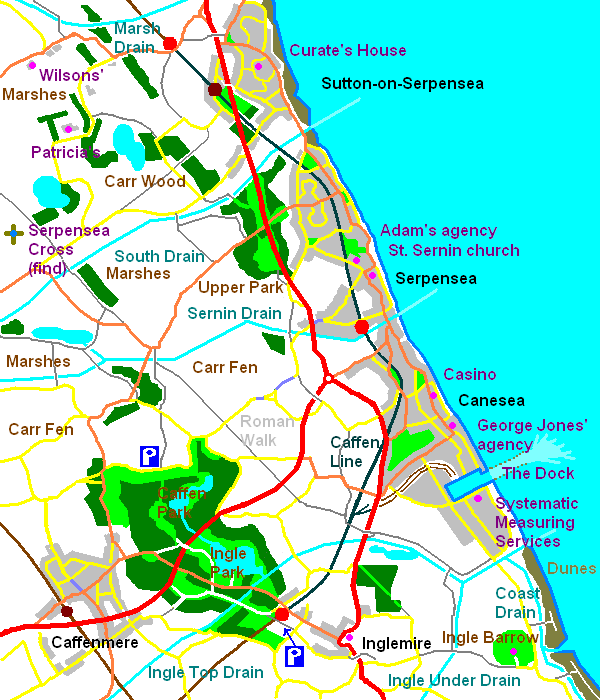 A sequel to Serpensea Secrets would be among the practitioners of the independent Church, and perhaps would centre around a conflict with the parish church and national Church (note: it is never called the Church of England! ), or with the police, or with a rival Church. Perhaps it could be bizarre and introduce time travel, a portal or portals by which the lead character can visit situations and settings of the past - when religion was supernatural and magical religion. My recent if occasional contribution to Thinking Anglicans hasn't been published. The full article of concern is by Simon Kershaw. It seems to me the article is quite revealing and I wanted to point this out, in a comment not in keeping with the positive ones otherwise provided. Obviously, it is too embarrassing. The baptism is the beginning of the historical Jesus, it says. Good, so that makes clear the birth narratives are indeed mythical and not historical. Simon Kershaw thinks the encounter with John the Baptist leads to Jesus abandoning his work as a carpenter (I'd say builder). So he starts as a disciple of John the Baptist and then is his own man, but both preach imminence. But with the arrest and decrease of the Baptist, it is time for Jesus to increase and to proclaim the year of the Lord’s favour, the imminence of the kingdom of God. The point I make is that here, into history then, we find both are wrong, that the change that would have swept away the Romans, the Kingdom, didn't come. Jesus was wrong. Then there is the second point I picked up. Is it any wonder that it was these remarkable meals of Jesus that his followers continued — and that they continued to recognize his presence at the breaking of the bread? In other words, the 'resurrection' here is the presence in the ritual of the meal, and I made the point in the context that they expected Jesus's return (never mind who John or Jesus might have expected to come from God as a messiah). The early Christians have it that Jesus would be the messiah returning, and he didn't. The Lord's favour is now, says Simon Kershaw in his piece, now writing theologically. But if you are going to rely on history, let's get the history clear and not smokescreen it by sleight of hand into a piece of theological devotion. The liberal approach to theology has to be honest, and smokescreening into devotion isn't effective if you rely on a history that won't deliver. But the easiest way is not to publish comments of critics. With the given comment below, the remarks in blue ought to be dismissed (and an apology after the fact is offered here) as the comment I made is now shown on TA. Oh these junk filters! I once knew a Linda Jack. Her dad was a prison officer. Apparently there's a private prison costing loads because they have to get in public servants to calm the prisoners down because the private cost-cutters don't know the tricks of managing a prison. The prisoners do, so the lunatics have been running the asylum. That's what this government is like. The lunatics are in charge, whether Michael Gove in education or George Osborne as Chancellor. The latter is despicable, who positively enjoys policies to grind the poor into the dirt. He works on one little tribe to oppose another, like the working poor he also grinds into the ground becoming more hateful of the poor who can't get a job, while of course Cameron talks about immigrants and benefits. This is one nasty bunch. But there is no narrative of the Liberal Democrats being the good guys in all this. Linda Jack reminds us that Nick Clegg and Danny Alexander do not speak for the Liberal Democrats. I think they are more influential and action-making than Linda Jack and by their deeds we judge them. No one likes poodles and fewer still like turncoats, and the Liberal Democrats are both. Without them propping up the Tories like wooden legs, the Tories could do none of what they are doing and want to do. Political parties cannot go about saying please vote for us on one basis and then acting on an entirely different basis. That's what the Liberal Democrats have done and it is called stealing votes. I voted for them on the basis of their manifesto and I was robbed, as were so many others. For years the Liberal Democrats were even to the left of Blair's Labour, but now in power they have lurched to the hard right, made the hard right possible and actual. Cameron was once himself a kind of 'progressive' approach to being a Tory, if such is possible, but the criticism of Major about this government (because of where Major grew up, the people now suffering under this lot) has shown this up. Basically Cameron is a Public Relations air-head, and never stood for anything other than appearance. During the floods he went to Kent not to do anything or learn so to offer practical help but to be seen. His PR stupidity was shown when he said he was with 'Team Nigella' during the recent court case involving her employees, causing the judge to have to say words. He is a pathetic Prime Minister because he is allowing all the right wing nut jobs to run amock, and of course he easily joins in (because he doesn't believe in anything himself). He gets on well with his mate Nick Clegg, and Danny Alexander gets on well with George Osborne. Linda Jack should be mobilising what remains of her party to kick out said Clegg and Alexander. That's if the electorate doesn't get them first. If I lived in Sheffield I'd be after Clegg's blood, and get him out and hope the massacre of the Liberal Democrats teaches them a lesson they'll never forget. Meanwhile, even if my friends tut tut I'm becoming more impressed with Ed Miliband. I wish he did have the outlook of his father Ralph, but a bit might just rub off. The insight that the economy is there to serve us (cost of living) and not the other way around might just begin a sea-change in policies. No more privatising prisons, for example, and let's have a State investment bank and, leave the East Coast Main Line provider alone and indeed bring more that way so that we can get a return to British Rail and save money on how the railways are run. Oh yes, that was Mr Major. We forget that the Prime Minister who wrecked the railways was John Major, bringing massive bureaucratic costs to an industry that best competes with road and air rather than itself (which it doesn't, anyway). Let's hope the coalition government collapses in 2014. But don't bet on it. The Liberal Democrats will cling on and cling on. But like their own Vince warns, this recovery may not be a recovery. There is still debt and liquidity swilling around, and one nudge and back it has gone into property again. It will all end in tears again, and Osborne will be as clueless as he is ideological. What a nasty piece of work. I'd never vote Tory in a thousand years (I did in 1979!) but the Liberal Democrats now may have to wait as long, certainly with this bunch in charge and with a rump of a party left after the next election as destroyed by the props, poodles and turncoats that run the party today. This is a response to The Inquirer article dated 4th January, although I saw it a day early and accounts for my response being a day earlier in construction than the original! Reverend Bill Darlison's long piece in The Inquirer (4 January 2014) has much to commend it, but needs challenging on its central point about the 'new orthodoxy', as if dissent is a virtue in itself. At the same time we have Larry Bode in the same issue declaring that he has gone off to the Sunday Assembly, where he will find interesting talks using that new orthodoxy. Bill declares the new orthodoxy to be "scientism", whereas Larry will find speakers discussing findings of investigative and mathematical science. I don't mind 'walking backwards' (Spike Milligan fashion) with Bill into the glitter and colour of religious feeling and sentiment, but I certainly do object to finding alternative explanations for reality in magick and the supernatural. The fact is that mathematical and investigative science delivers results. I'm aware that they feed into broad patterns of understanding that change and change dramatically as the results change, but falsification is a powerful tool towards what we best know, and tis includes strong paradoxes at the edges of science and mathematics. What Joseph Priestley the dissenter or Isaac Newton the dissenting conformer could do in their day is no longer available. Let's be clear here about terms. Magick is where humans have godly powers and participate in and warp some strange realities, and the supernatural is where God intervenes usually through humans. Newton was one fantastic scientist and mathematician, but he thought he could apply those principles to a hidden code in biblical text - gematria. In other words, he could combine science and maths with a form of magick through text. Priestley, on the other hand, was a materialist, so he could combine belief in chemical processes with miracles happening by God via Jesus's hands and mind and indeed he believed in the biggest miracle of the resurrection. But we now realise that biology does not allow a dead brain to reconstitute - it rots and damages so rapidly - and we also understand the limitations of historiography. This is why so much of even evangelical theology today is about 'text' and 'encounter' and has become largely ahistorical. It has to be said, too, in response to the article, that corners of the Anglican Church are far more intellectual than Unitarianism, but this is because the theologians are ever more skilled at twisting theological terms into appearing as one shape when it means to retain itself like another. This, I suggest, is a waste of intellectual effort, and we don't find it with Unitarians and this, as such, to Unitarian credit. But the alternative, for religious enrichment, of going back into magick (like astrology, for example) as an explanation for anything is even more regressive and simply fanciful. For example, many people these days are into such as Tarot cards and the like to explain life patterns. But do the history of how Tarot arose and you see yet again that here is no more than a fanciful invention of some individuals regarding the Egyptian God Thoth for which there was no original Book of Thoth beyond the Greek Corpus Hermeticum. Over and again the sort of connections the magicians want to claim fail their own tests. But, I am told, people will pay £50 for a "skilled" reading. Skilled at what, exactly? Now I don't mind a bit of, say, 'four elements' expression with a bit of wind-direction as a left-field way of saying something that draws on more than the factual, just I would do rewritten eucharists, but it is the equivalent of doing communal art that draws on the past. It does not explain anything, except living in the past. Otherwise we end up going down the road of a Henry Lincoln, who set up all kinds of improbable "probable" connections between things that owe more to the imagination than any testing. Dan Brown drew on all this, and he is a novelist. And the magicians are forever criticising actual probability! But the further fallacy is that there is some other objective alternative. Pope Benedict might have thought there was, and the former Archbishop of Canterbury Rowan Williams set up such a detailed narrative theology that he acted as if there was. That's why he was a multiculturalist - because he could hop between narrative world views, including world scriptures, just as he did between languages, just as he could immerse himself within the rules of poetry. The question remains one of spiritual depth and how to achieve it without going down a road of self-deception. How do you achieve something perhaps science-like that isn't science, or history-like that isn't history, or some other method of guided searching? I knew an Anglican minister of religion who once said to me, "What if it is all make-believe?" and then insisted he was no liberal because he stayed with the tradition as a whole for its 'spiritual benefits'. It's a kind of knowing self-deception when, for everything else, he joined the modern world for how to explain something, such as (explicitly) the Dawkins explanation for biology and evolved life. This approach is called by some Radical Orthodoxy, though the truly Radical Orthodox get so inside their bubble that they recreate a platonist universe and dismiss the outside world. They abuse postmodern space to become premodern self-deceivers. The alternative is a kind of acceptance of a flatness to reality, of a kind of lightness to all this wanted depth. My answer to Bill and others is perhaps an acceptance of the unbearable lightness of being, and that the depth thing is only ever a form of play. I doubt Sunday Assembly would suit me (despite much agreement) simply because there the God and religious language is excluded. I still have uses for it, even in a soft non-realist or relatively atheistic manner. There are still discussions to revisit and inherited ideas and visions to include and not exclude. There is clearly a lot of discussion and argument to be had. We are people of now, and not pre-moderns and we do it with a light touch. And I would retain these views, even in a falling aircraft. We are tribal beings, we set up depth-systems of engaging that involve exchange or give and take. But our once elaborate means of give and take are seen through, just as the really modern magicians - the illusionists - see through the tricks of perception. We see through these old constructions now, including when we change perspective about how the facts fit together. The South African Anglican Church is noted as being different from almost all the rest in the African continent for its inclusive attitude towards gay people, at a time of dreadful legislation and moves towards oppression in places like Nigeria and Uganda. This is in no small measure due to the influence of people like the former Archbishop Desmond Tutu who could see the connection between justice and inclusion when working against apartheid and other issues of justice and inclusion. "I have spent my life fighting discrimination and injustice, whether the victims are blacks, women, or gays and lesbians. No human being should be the target of prejudice or the object of vilification or be denied his or her basic rights. "But there are other issues of justice - not only for human beings but also for the world's other sentient creatures. The matter of the abuse and cruelty we inflict on other animals has to fight for our attention in what sometimes seems an already overfull moral agenda. It is vital, however, that these instances of injustice not be overlooked. "I have seen firsthand how injustice gets overlooked when the victims are powerless or vulnerable, when they have no one to speak up for them and no means of representing themselves to a higher authority. Animals are in precisely that position. Unless we are mindful of their interests and speak out loudly on their behalf, abuse and cruelty go unchallenged." He makes this statement in a foreword to The Global Guide to Animal Protection just published by the University of Illinois. He further justifies the matter in Christian terms that dominion over animals is not despotism, and that humankind is made in the image of God in terms of being "holy, loving and just." "If it is true that we are the most exalted species in creation, it is equally true that we can be the most debased and sinful. This realization should give us pause … There is something Christ-like about caring for suffering creatures, whether they are humans or animals." His call is that: "Churches should lead the way by making clear that all cruelty - to other animals as well as human beings - is an affront to civilized living and a sin before God." I wonder myself what a less specifically Christian approach can be to this matter. Evolution is based on death, a food chain that results in species diversity as genes are passed on. We see insects that can organise and specialise, and higher animals acting tribally that can be quite 'authoritarian' within. We see 'redundancy' where some less efficient genes are protected within a species because, at times of environmental upheaval, these genes may be the ones to survive. Clever survival is adaptable: it is practical as well as simply ethical to look after the weak and the different. But as the highest of the animals in terms of language and keeping a library, and thus historical culture, we have built up technology that largely protects us from natural selection (until the terrible disease or asteroid comes). What comes with self-consciousness is a developed ability to empathise, especially about pain in the other, especially pain in the unknowing creature as regards the future. The ethic must be to minimise the pain and to increase the beneficial experience of living itself. So this brings about responsibility, responsibility to research the sentience of animals and to treat sentient life with respect - to extend the principle of do as you would have done to you, the ethical golden rule, but with regards to what is a food chain when left to itself. Although some animal ethicists are vegans, the ethical position starts with agriculture itself and how that technology of humans is used in husbandry - a husbandry that can allow some animals not to look over their shoulders at predators. It may be that the better ethical position is possible with technology. Most animal ethicists are practical, and however far they would like human behaviour to go, they want issues of justice to apply in the world in which we do live. You have to start from where we are. Living in this world and being practical is how I understand Andrew Linzey's repeat call for an international court to try cases of animal cruelty and with a stress on the culpability of governments. It's not about regarding any animal husbandry as cruel, as I understand it, as might be claimed by some vegans, for example, in their vanguard of ethical claims. This in a world that sadly sees the likes of Syria where there is a distinct lack of empathy regarding human beings including children, never mind animals. The Global Guide to Animal Protection does not just look at human indifference and cruelty toward animals, or exploitation, but also looks at individuals who have challenged and sought to change exploitative practices. The volume is edited by Oxford theologian Professor Andrew Linzey, director of the Oxford Centre for Animal Ethics. See http://www.oxfordanimalethics.com for more information and the ethical position held. The Global Guide to Animal Protection is available from http://www.press.uillinois.edu/books/catalog/69wgp5qn9780252036354.html priced USD95 (cloth) and USD27 (paper).